The Stockholm International Water Institute (SIWI) is a policy institute that seeks sustainable solutions to the world’s escalating water crisis. SIWI serves as a platform for networking among the scientific, business, policy, and civil society communities. SIWI’s interests include integrated water resources management for food production, drinking water, sanitation, health advances, pollution prevention, and poverty reduction. SIWI aims to promote future-oriented and knowledge-integrated views in decision making about water. In order to stimulate research and development in water-related issues worldwide, SIWI administers an annual series of prizes and awards in association with World Water Week. 1 — Stockholm Water Prize. This award is to individuals, institutions, and organizations whose work contributes to the conservation and protection of water resources, and to improved health of the planet’s inhabitants and ecosystems. The amount of the Prize is US$150 thousand. 2 — Stockholm Junior Water Prize. The Junior Water Prize is open to young people between the ages of 15 and 20 who conduct water-related projects focusing on local, regional, national, or global topics of environmental, scientific, social, or technological importance. The amount of the Prize is US$15 thousand. 3 — Stockholm Industry Water Award. The Industry Award is for public and private enterprises that help improve the world water situation through innovation. The Prize is honorary. APPLICATION: For each prize and award, SIWI posts eligibility criteria and procedures for nomination or participation. SIWI’s prizes and awards are made on an annual cycle, and calendar deadlines are posted. SIWI provides contact information for each category of prize and award. SIWI offers profiles of its previous award recipients (“laureates”) in each category. This can be useful information for nominators. The Stockholm Junior Water Prize sponsors national competitions before finalists are selected for the international competition. SIWI’s website provides the contact information in each country. 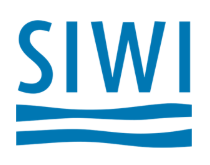 With Swedish and other European partners, SIWI offers international training in integrated water resources management and trans-boundary water management. Interested individuals should review details about capacity building on SIWI’s website.